Welcome to episode 26 of the Investing for Beginners podcast. In today’s show, we will discuss the return on capital formula by Joel Greenblatt. The Magic Formula is a great formula that helps identify companies with a low P/E ratio and a great return on capital. This show will continue some discussion of numbers and formulas, so for those of you that are not fans of math, we will break it down into the easiest forms that we can so it doesn’t overwhelm you. Andrew: This is a formula that is very value investing based and Joel Greenblatt, he is a fund manager who has had a ton of success with this formula. He saw a lot of success, made a bunch of people a lot of money. Then went out and wrote a book laying this formula out, and how he picks stocks. Very reminiscent of my Value Trap Indicator formula, except he obviously has a much longer track record than I do. In the sense that there are these specific rules and basic equation that is based on pure financials. He took that magic formula as he calls and he put it in a book called “The Little Book That Beats the Market.” Ended up being a best seller and went on to do well. I know he had a period where he was making 20 or 30 percent return per year for decades. Crazy returns recently haven’t been as strong as it was in the past. Just like with any value investor, guys like Buffett who might underperform during a really strong bull market there are always periods they will outperform or underperform. It depends as we talked before, backtesting depends on where you draw the line and what time range you are evaluating, but a guy like Joel Greenblatt and this Magic Formula has proven to do extremely well for a very long period. It is obviously something that’s worth discussing. It is kind of technical, and there are some numbers behind it. As I do with all numbers or metrics, valuations, obviously this is a podcast that is structured for beginners so I want to take these complicated topics and try to make them as simple as we can. That is going to be the goal for this episode, and hopefully, even as you’re listening, you’ll be able to get some insight into that and start to see some things click. So that you can say, this is just another tool to have in my toolbox. And another piece of information to know, or strengthen your beliefs in some other tactics you might use, that are similar yet maybe not completely the same. A lot of those type of principles do apply here as well. Do as when you’re a value investor those type of things can apply for yourself as well. He just breaks it down into two components, and the magic formula is based on the earnings yield and the return on capital. If you go back and listen to one of our most popular episodes, it’s called the Useful Guide for Stock Market Valuations. We talk about some of the most common valuations, and one them that we discuss is the P/E ratio. This ratio is discussed all the time, in the blogs, media, and even on TV. Almost any book you open up will mention P/E in some way or other. When you look at P/E and earnings yield, understand that it is the same thing. Earnings yield just the PE flipped, so where the P is the price to earnings, that means the price of the stock divided by the earnings per share of the stock. And earnings yield is going to be the earnings per share of the stock divided by the price of the stock. Because it is the same thing, we know that it is going to measure the same metrics, what that means for us as investors is a ratio like P/E is one that is going to number one keep us in stocks that are cheaper. Number two it is going to keep us in stocks that are profitable. Because if a stock has a lot of profits, then that earnings side, the top side of the formula is going to be a lot higher, which is going to push the earnings to yield up. Where a P/E you want it to be as low as possible because the earnings yield is flipped you want the earnings yield to be as high as possible. And the same kind of thinking comes along with the price as well. If a stock is beat down and the pessimism is there, that is going to push the stock down and make it undervalued. Chances are it will be undervalued, depending on how the other metrics look, but the lower that pushes it down obviously, the lower it is going to make the lower that price goes down it is going to push the earnings to yield up as well. In that case, the price is in the denominator, as the price goes down our earnings yield goes up, and those are the two of the things we like to see. High earnings and a low price, flip that over if the price starts to go higher, then that price part of the equation is getting higher, and it is making that earnings shrink. Now the way Greenblatt kind of described his version of earnings yield, I simplified it there by calling it the inverse of P/E. Depends on who you talk about and how specific you want to be, Greenblatt made it more specific in that he said, it’s the EBIT, which is earnings before interest and taxes and then divided by enterprise value. Which add some aspects of the balance sheet and the cash flow statement. It’s some of those technicalities, maybe you can speak with this Dave, I’ve read the audible version, and he didn’t mention earnings yield in this definition. I know some investors do kind of use the whole EBIT and Enterprise thing. It is going to be a difference that is such a small scale, which it is not going to push the needle too much, but I think it is important to at least acknowledge it as we cover it. Do you know if in the written version of the book if he calls earnings yield the P/E flipped? Or if it was the EBIT/ Enterprise value thing? Dave: He was more of the technical side of it. He went with the EBIT divided by the Enterprise Value. 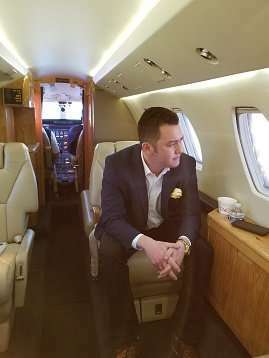 He didn’t go extremely into depth on Enterprise Value or EBIT; he just talked a little more surface about them as opposed to diving in and getting to the nuts and bolts of them. The book as you know is more geared towards kind of a younger crowd; I read something that he was writing the book for his kids to try to teach them how to invest. He had a seven and eight years old and was writing the book for them to learn from. He did talk about both of the factors of the formula, but he didn’t go into depth about either EBIT or Enterprise value such that it was confusing. For our purposes today, I think we would probably just be better suited if you are all right with it to just stick to the way you are explaining it. Because if we start talking about Enterprise value we are going to start going down a rabbit hole, and I don’t know that we want to go down that hole because it would be a little complicated. That might be another conversation that we could have for another episode. Andrew: Yeah, I agree. All right kids take out your textbooks and go to section four of page 300. Now that you bring it up I know that he did explain the basics, what I am trying to do. He has a resource on his website that calculates it all for you. You don’t necessarily need to know how to calculate earnings yield based on Enterprise value. The more presents it on why it works, then let the details fall, and somebody can pick it up if they want to, but it is not necessary. The second part of the formula would return on capital. Let me explain how he is using these metrics and how they relate to the Magic Formula. Instead of taking these valuations and I am only going to buy a earnings yield of 20, there is no hard, fast rule for how he’s looking at these valuations. Which is actually kind of a different approach to the way a lot of investors like to look at stocks with certain generalities? I obviously do look that way to an extent; I have my kind of flavor aside from that. I have talked about that countless times. How he does it is that he ranks these stocks based on both the earnings yield and return on capital. He pulls a list of stocks and ranks them from 1,2,3,4, and 5. These stocks have the best earnings yield out of the whole list, number two and three. Same with return on capital and then those ranks are averaged out, and then you get a total average and then he buys the top ranked based on those two metrics. He has a couple of rules, we can get into that a little bit later, both in the back tested and his track record, it did do very well. The return on capital is going to be where the earnings yield is looking at profitability and where the stock falls in the stock market, whether it is cheap or expensive. That’s focusing on the income statement, and now we have the return on capital which is also looking at the income statement, but it is looking at it as how it relates to the balance sheet and the cash flow statement. Return on capital can be calculated a variety of different ways; it’s funny because the deeper down the rabbit hole you go with some of these formulas, I’ve seen these metrics where you put it into Google, and I’ve seen two different calculations for the same metric. Return on Capital if you take the really strict definition it’s again EBIT at the top, and we are looking at Net Tangible Assets plus working capital at the bottom. To put that in layman terms, again we are going to look at the earnings at the top, but at the bottom, we are going to look at what does the company have that is liquid, and kind of combination of the balance sheet and cash flow. When we talk about Net Tangible Assets it is how much real estate does this company have? How much inventory do they have? How much are their plants where they manufacture their products, how much is that worth and what is that cost, or value? The working capital section which is part of this denominator, is talking about how much cash do they have? Again as I talked about in the cash flow statement and it can include things like current assets, current liabilities, accounts receivable in inventory. Jargon, don’t worry about it too much. It is going to look at what’s the short term cash picture of the company and what is the long term asset picture and how much the company is worth. That is really what we are looking at when we want to see the return on capital. That is the capital part of the equation is the value of the assets and how much cash they have on hand. Because that part is in the denominator, it is going to work in the same way that price works. The lower the price, the better our earnings yield, the lower the capital, the higher our return on capital went. That might not make sense, why are we rewarding, because Greenblatt wants a higher capital return on companies. Why are rewarding companies with lower cash, less real estate, plants, and equipment? Why would we want companies that are less than that? The reason is that is telling you that the company doesn’t need as much cash to be able to make money. Think about the newer, technology stocks like Facebook where lately it’s been able o get its earnings up. Don’t quote me how their earnings picture is now, or their return on capital is now but just think of it. If they were the perfect business and all the needed was a couple of engineers, a couple of finance people but they had this crazy website that didn’t need all these expensive plants to survive. That would be a low capital intensive business because you don’t need to funnel a lot of cash to create cash. It’s an argument about whether they are having successes or struggles with that, maybe that was a bad example to bring up. The idea is that a higher return on capital means that we can put you into companies that are going to grow at a much-accelerated rate because by focusing on earnings yield we are getting high-profit companies. The second part with high return on capital we are getting that high earnings but as those earnings are reinvested into the business because it doesn’t need much capital each dollar they are reinvesting will create even higher levels of business. That’s why Greenblatt likes to look at return on capital. It’s another reason why return on capital is used a lot when people evaluate growth companies and things like even the guys on Shark Tank I think they use something similar to return on capital. It can be a good way to evaluate, not necessarily how fast a company is growing but how much potential it has to grow. The idea is that if the return on capital is high, then it’s the obstacles in our path as not as high to create growth. Assuming you don’t reach saturation because the company is not as capital intensive, which means the business model looks nice, profitable, that’s just the nature of the business. Some industries and some business models can just be straight up better than others and the return on capital because it has again earnings on top is giving us this double emphasis on earnings. So you can see if the earnings are high, just, in general, it is going to make our earnings yield high. Which is the first part of the equation, if the earnings are high it is going to make the return on capital high. Make no mistake about it, Greenblatt putting his investments into companies that are putting out high amounts of earnings in addition to some of the other things such as undervaluation or capital intensive or efficiency. He is putting a heavy focus on the earnings. Dave: Yes, he was the beauty of this system is it’s there are some there can be some complication, not what I meant. It can be complicated if you dig into to the formulas and all the different numbers that can go behind it. Using the framework that Andrew laid out, it’s quite simple, and the other thing that is cool about it is too. Backing up a little bit and talking about Greenblatt and maybe some of the success. He ran a hedge fund in New York City called Gotham, during a 15 or 20 cycle he had 40% returns annualized over that period which is obscene, and this is before he came up with the Magic Formula idea. He’s an interesting guy, and I’ve read three of books, he’s a great writer, he writes to even to a beginner level even though he is very accomplished as an investor. He knows everything and anything about the stock market and how it works. He’s able to write in a style that the average investor can easily understand. His books, the book that we are discussing tonight where he talks about the Magic Formula, I read in one day. It’s not long, a couple of hundred pages at most and he tells a lot of great stories about his kids, just explaining things. It is a very easy, enjoyable read and when you’re done, and you realize that you learned a lot and it’s not a textbook kind of book. The Magic Formula that we are talking about tonight I believe over the back testing that he did it had a 30% rate of return over that period. Which is again, is ridiculously good. And like Andrew has said the last few years it had not done as well, but the thing is in the book he spends a fair amount of time explaining his testing. One of the things that he does is that he lays out how his thought is on the how the formula would work best. Unlike finding the intrinsic value of a company or calculating the return on invested capital, or return on assets or any of these more complicated formulas. What he does is that he uses this whole process as a screener to find stocks that he would invest in. The way that he lays it out, he will break it up into either 30 or 50 different companies that you can buy. What you do is you go through the process, and you find the 30 best companies based on this formula, and you buy all 30 of those companies, and you hold them for a year. And after a year, you go and do the whole process all over again and any of the companies that have fallen off for whatever reason you sell the ones that are not on the list anymore. Then you buy the new ones and add them in. Based on doing this, if you do this over a three to five-year time slots if you will. There were some periods of time where it didn’t do as well the first year, or maybe even the second year. But the third, fourth, and fifth year it kicks some serious booty. Or maybe you would have a slot where the first two years were awesome and the next three years were not so great. Instead of taking a big chunk of time and just flat laying it out, he broke up his back testing to illustrate that yes, there are periods of time where it won’t do as well. Over a long period, it’s going to do well. It’s again one of those situations where you have to be patient with what you’re doing, and you can’t just walk in and go expect to make 45% the first year. And then I’m out kind of thing. It’s based on value investing, Joel Greenblatt, make no bones about it, he is a value investor. But he also dabbles in a lot of other things, and Andrew mentioned earlier about the growth stock part of it. To me when we look at the Magic Formula I look at it as a little bit of both. I look at it as a combination of a lot of the foundation is based in value investing, but there is also a growth component to it as well. I have used this formula on a test that I’ve done as well for myself. And the first year that I did it, it came back at a little above 18%, and this year it’s not doing as well at about 10%, so far this year. It’s not done horribly by any stretch, but it’s not in the 30%, and I will be curious to see how that progresses going forward. I am accounting for any fees that you have to take into account when you buy 30 individual companies, that is a very real cost, and you have to take that into account. Andrew: You talk about having a component of growth and value, and I like how the earnings yield obviously has value investing in it with the whole price aspect in there. It’s interesting that return on capital has nothing to do with price, whatsoever. You could be most definitely get a high return on a capital company that has the biggest bubble that we have ever seen. What’s nice is how he balances them between saying well I want both of these, the two components to both ranks highly. That in effect, allows you to get the best of both worlds, in the sense that a company that’s a bubble stock but also the highest growth stock. It is automatically going to be canceled out because the earnings yield is going to be so low for a rank. In that sense, you are getting the cream of the crop pushed to the top from both the value and growth perspective. Dave: Exactly, I think that is what he was going for when he came up with this idea, and I think that is one of the things that I liked about it and appealed to me. I read this book early on in my investing career, and it opened my eyes to the different ways you could look at investing. It wasn’t just a matter of following the Warren Buffett model, Monish Pabrai model. Joel Greenblatt has his way of doing it. That is one of the things that I find so interesting and fascinating about the whole investing world, is that there is so many different slices of the pie that you can look at and take a little bit from this and that you can create your idea that will work for you. There is no hard fast you have to do it this way, and there is no other way but the highway kind of thing. Andrew and I are very much in the value investing camp, and we both are big advocates of the style of Warren Buffett and Charlie Munger advocate. But we also look at other things and take into consideration other ideas and other aspects of investing that are out there. One of the things that I like about Greenblatt has done with this formula; he has made it very accessible for people. The book obviously as Andrew has mentioned was a best seller, and it still does very well. It is an easy book to find, you can find it at your local library. Another thing that is cool, he could easily and sell this and make just make gobs and gobs of money. But he doesn’t, he has a free website that you can go to which is called magicformula.com and there you can sign. It is a simple matter of using your email address and creating a password, once that is complete you have access to the screener. So you can screen for these companies yourself, he does all the work for you. You just need to decide whether you want to see the list for 30 or 50 companies. If you don’t want to try this with actual cash you could test it yourself by setting up a watch list and add these companies to that list and follow along to see how they will do for that year. 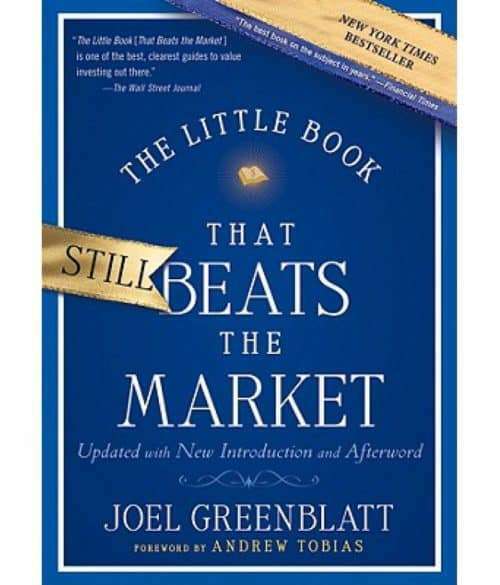 I mentioned earlier that Greenblatt is an interesting guy, and he’s changed the way he invests through his life, and he’s gone away from the magic formula now into more, He’s still following a lot of the same ideas of the return on capital but instead of just 30 or 50 he’s now got hundreds of stocks in his portfolio. He has branched out from what he created with the Magic Formula; it is interesting to me how somebody so accomplished can keep trying not necessary to reinvent the wheel. But find a new way to look at what he is trying to do and see if there is another way that he can beat the market. Andrew: I think that shows right there that there are no hard and fast rules, he is proving that himself by constantly evolving the way he’s doing his investing. Warren Buffett talks about that too, how he can’t buy the same stocks that he used to be able to buy before Berkshire Hathaway had $200 billion dollars because nowadays if he was trying to buy some of those stocks, he is buying some of those stocks outright. That is just not practical for him and his purposes, so he has to buy a lot of the stocks that are a bigger market cap. I think that’s the most important part of this whole discussion is the idea that, like you need to taste all the different pieces of the pie and figure out which one you like the best. Because at the end of the day, if you’re going to try to clone/copy a Greenblatt, Graham, Buffett, the problem is that they have internalized this and they understood the parts that make sense to them the most and the parts that align with the values, so to say. When they see their portfolio underperform, which is inevitable, you’re going to have periods of time where your portfolio is going to underperform. We are talking about a short time, where you see the S&P did 15% and you only did 10%, or a two year period where the S&P beat you. But over the long term over decades, you should be beating the market if you’re using a successful value investing approach. The only way you will be able to stay grounded and have the discipline and persistence to stay with your strategy. Is if you 100% believe it and 100% internalize it and why it makes sense in your head, and why you are confident to stick it through. I think that is why it’s important to try to expand your horizons and not pigeon hole yourself into one way or the highway sort of mentality. There is a lot of different things and different pieces that you can learn. Not just from investors but from daily people in your life. There is always someone you can learn something from. I think that applies to investing and applies if you are going to try to buy stocks with a value investing approach. 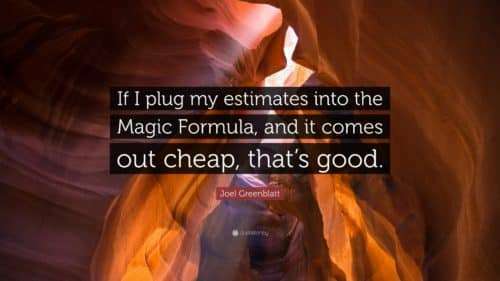 I hope that these two components of Greenblatt’s Magic Formula make sense, I hope we were able to simplify it and hope it helps open your mind and helps you process what these numbers that are inside a companies financials and what kind of stories they are telling. What they are saying about the health of the company and how you can use that to your advantage, and pointing in that path of the type of performance that you are trying to achieve with your portfolio. That is going to do it for today’s episode and our discussion of the Magic Formula. I hope you enjoyed our talk and you can take some useful information away from our chat. If you enjoyed today’s show, please give us a review on iTunes here or download the episode on your favorite app. Until next week, invest with a margin of safety, emphasis on safety and we will see you next time.